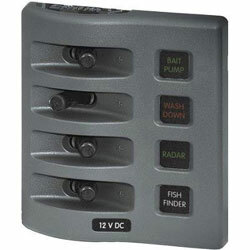 Blue Sea Systems 4304 WeatherDeck Waterproof Toggle Switch Panels are designed for open-cockpit and flybridge applications. Rated IP67 - Temporary immersion for 30 minutes . No lights in any position likely indicate there is no power to the panel.